Though it required negotiations that stretched nearly seven months into the fiscal year it is designed to fund, the FY 2018 Omnibus Appropriations act won the approval of a sizable majority in Congress and the reluctant approval of the President at the end of March, providing substantial boosts in Federal spending, including healthy increases to science investments across the government. Passage of the omnibus bill was made possible by an agreement in February to increase statutory limits on discretionary spending for FY 2018 and FY 2019. That extra spending room ensured that congressional appropriators could boost military spending sufficiently to satisfy a majority of the GOP and increased non-defense spending sufficiently to woo enough congressional Democrats to overcome opposition from the conservative Freedom Caucus in the House. In the end, the 2,000+ page bill boosts Federal discretionary spending to $1.3 trillion in FY 18, and boosts Federal R&D efforts by nearly 13 percent. While appropriators generally don’t spread funding increases evenly throughout their bills, overall, science agencies fare well in this bill, in many cases receiving meaningful increases for the first time in several years. Overall, NSF will see an increase of 3.9 percent in FY 18, bringing its total budget to $7.77 billion, $295 million more than FY 17. The Research and Related Activities Account — the home of the Foundation’s research directorates, including the Computing and Information Science and Engineering (CISE) directorate — will see an increase of 5 percent to $6.3 billion, the highest it has received since FY 10. The appropriators were silent on how that money ought to be distributed to the various directorates, but historically, the NSF Director has tried to distribute increases proportionately across the directorates. NSF’s Education and Human Resources Directorate, home to many of NSF’s STEM Education programs, will see an increase of 2.5 percent, bringing its total budget to $902 million in FY 18. The Department of Energy’s Office of Science received one of the largest increases among science agencies in the bill, growing 16.1 percent to $6.26 billion in FY18. Included in that increase is a substantial 25.1 percent increase to the Advanced Scientific Computing Research (ASCR) program. Much of the ASCR increase is focused on the office’s exascale efforts, with the Exascale program receiving an increase of 25 percent (to $205 million), including increases to the Mathematics and Computer Science research accounts, as well as significant increases to current DOE HPC labs at Argonne and Oak Ridge in preparation for exascale deployments beginning in 2021. ARPA-E, which faced elimination threats in both the President’s budget and the House appropriations bill, survives in the omnibus and grows to $335 million, an all-time high funding level for the office. NIH will grow $3 billion, or 9 percent, in FY 18 — $10 billion more than the President’s request for the agency. The omnibus increases the size of the BRAIN Initiative to $400 million in FY18. Of note for NIH is a proposal in the President’s budget for next year (FY 19) that would consolidate three agencies currently under the Department of Health and Human Services — the National Institute on Disability, Independent Living, and Rehabilitation Research (NIDILRR), the Agency for Healthcare Research and Quality, and the National Institute for Occupational Safety and Health — into NIH. Given that these agencies — NIDILRR in particular — support a significant amount of work in computing and engineering, there are concerns in the research community that a move into NIH, which has a much different mission and culture than NIDILRR, would change the focus of the research in non-beneficial ways. 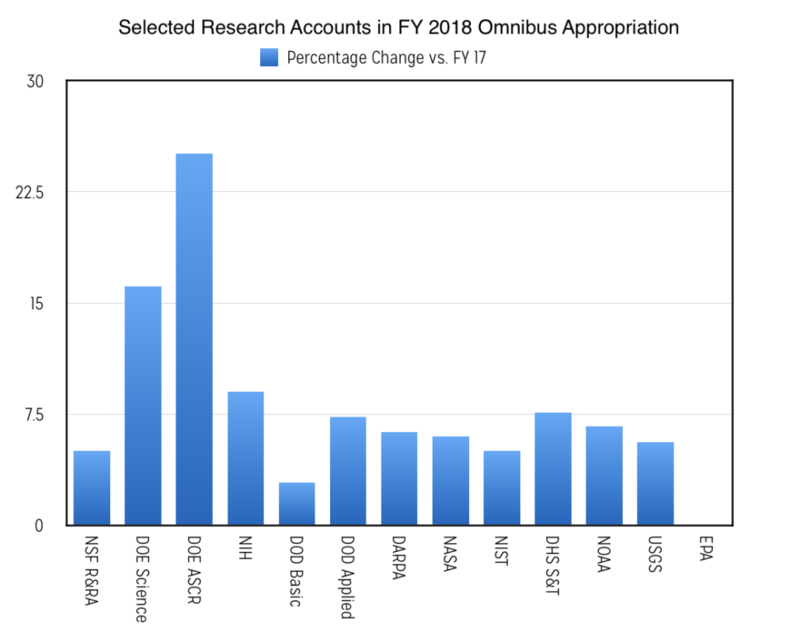 Appropriators in the FY 18 omnibus gave no indication that they support the proposed move for FY 19, but this is something that CRA, along with other members of the computing research community, are following. Across the department, basic research (6.1) will see an increase of 2.9 percent to $2.3 billion in FY 18, applied research (6.2) will grow 7.3 percent to $5.7 billion, and advanced technology development will increase 6.4 percent to $6.9 billion. DARPA will see its budget increase 6.3 percent to $3.1 billion, including a 20 percent increase to the basic sciences and large increases for ICT and electronics research, along with biotech and space technologies. NASA receives an overall increase of 6 percent to $21 billion. NASA Science accounts will grow 7.1 percent to $6.2 billion in FY 18. NIST Labs will wee an increase of 5 percent to $725 million. The Science and Technology directorate at DHS will see a 7.6 percent increase to $841 million. Of note, the President’s FY 19 budget request calls for DHS’ cyber security research efforts, currently housed in the S&T directorate, to be moved outside of S&T to the National Protections and Programs Directorate (NPPD), a more operationally-oriented office than S&T, raising concerns that the character of the research supported now in the program might change to reflect shorter-term operational needs. 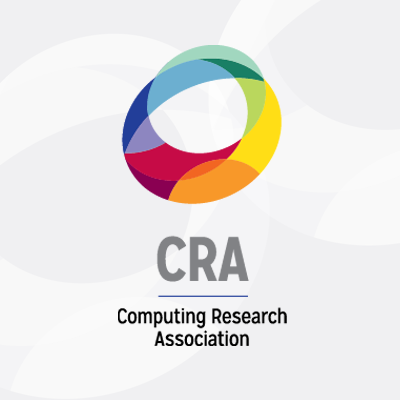 CRA and others in the computing research community are still considering the impact of this proposal on cyber security research at DHS and monitoring progress on this through the FY 19 appropriations cycle. NOAA will see an increase of 6.7 percent to $549 million in FY 18. USGS increases 5.8 percent to $1.1 billion. EPA’s Science and Technology program, a target of many on the right in Congress for its work on climate change research, will be flat funded in FY 18 at $706 million. Given the antagonism the agency faces, even from the Chair of the House Science Committee, a flat budget in FY 18 might be considered a positive outcome. Though neither piece of language guarantees new funding for efforts to improve CS Ed in the states, the explicit mention of computer science education for the first time affirms Congress’ belief in the appropriateness of those programs granting funding to CS Ed efforts. How much CS education flows will largely depend on the kind and quality of proposals received and the priority the Department of Education places on CS education. The omnibus boosts infrastructure spending by $11 billion to $21 billion in FY 18. Included is $265 million to increase rural broadband expansion through USDA; $398 million to support “cutting-edge science at National Labs and other DOE sites”; and, $500 million for “critical funds for cyber infrastructure resilience and protection. In sum, science agencies gained nearly across the board in the FY 18 appropriations process, reversing in many cases an 8 year trend of flat or declining budgets. In addition, the budget agreement passed in February allows for a little additional growth in the FY 19 appropriations process — about 3 percent for non-defense discretionary accounts — so we will be monitoring the process already underway and advocating for a continued priority on investments in research. As noted above, we will also be watching and advocating about the programmatic changes at HHS and DHS proposed by the President for FY 19 and will have all the details on the Computing Research Policy Blog (cra.org/blog) as we learn them.